Rose gold wedding sets are usually found in antique stores tucked away, off the beaten path. 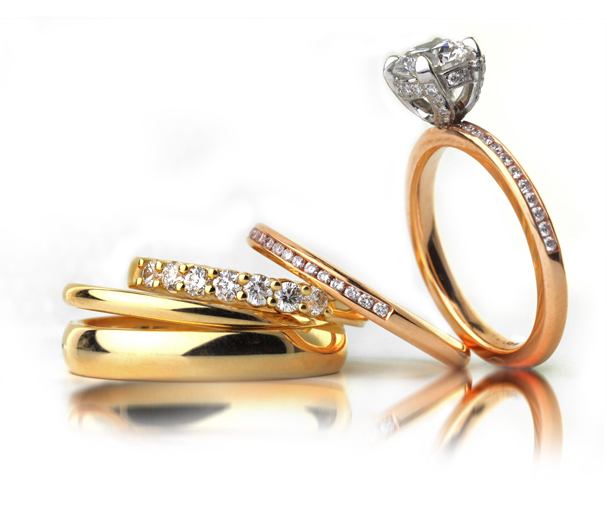 And, when you do find the perfect set–it’s usually so worn that the entire ring needs restoration. So…..I decided to creat an engagement set that has tiny micro pave diamonds in the band, ike my great, grandmother’s and the diamond setting is made of platinum with micro paved diamonds. Old style, newly mixed 18k rose gold, modern brilliant diamonds –the perfect fit for today’s modern girl. 18k yellow gold band with .35 carats of V-S clarity, E-F color diamonds. 18k rose gold micro pave band with 1.16 ct VS, diamond, F color.